Synopsis: Like everyone else living in Haven, seventeen-year-old Sophie Harkness is an Immune–a carrier of the genetic mutation that protects her from the virus Hitler unleashed upon the world more than half a century ago. A virus that wiped out most of humanity and turned two-hundred million people into vamps. But after her best friend is brutally murdered and several attempts are made on her own life, Sophie becomes determined to find answers to what seems to be a conspiracy running generations deep. And when she questions the peace treaty that keeps her small community protected, Sophie begins to discover terrible truths about herself and what it means to be human in a world ruled by darkness. Review: I won this ARC at Book Con this summer and at first I didn’t think I would read it. Once I decided to participate in #ARCAugust, I pulled all the ARCs from my shelf and made the commitment to give each one a try. Week 3 of #ARCAugust led me to this book and I am so glad that it did. I really enjoyed this book. I don’t normally gravitate towards vampire stories but this novel is different. CONFESSION: Yes, I did read the Twilight series after trying not to for the longest time and yes, I did like them. However, this book was nothing like the vampires in Twilight. These vamps were political and bold and the main character who was an Immune was fierce and brave. One of my favorite aspects of this book was that within the story there was a book that kept reappearing. That book was a fictional story to them about an alternate world, but that world was ours. I thought that was brilliant! 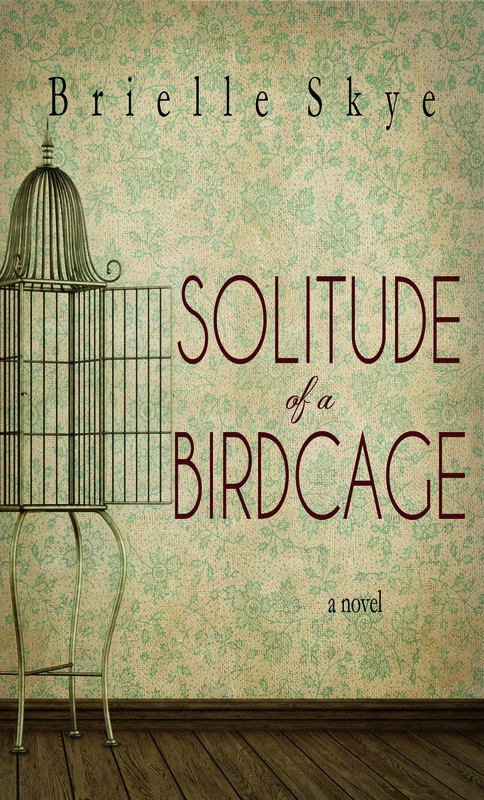 This was a long novel but I could not put it down and I am hoping that this is not a stand alone novel…I need more! 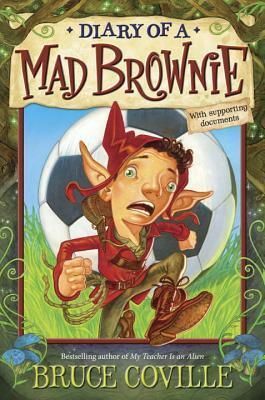 Next up was a middle grade novel: Diary of a Mad Brownie by Bruce Coville. It has been a while that since I have read a middle grade book for myself and unfortunately, I couldn’t get into this book. I wish I could say that it was only due to the fact that it was geared to the middle grade reader however, the main character, the brownie, had a heavy accent that made reading this very difficult and annoying. I was thinking of giving it to my nephew but it bothers me that the words that are used seem like misspellings instead of an accent. Then, I thought I had completed my goal of reading all of my ARCs from my TBR shelf until I looked closer and found one more hiding there. 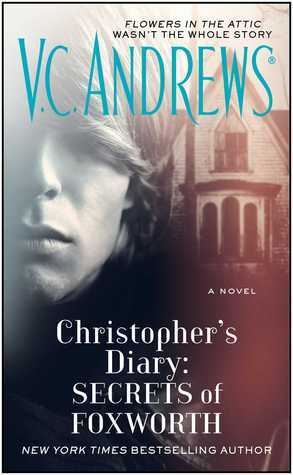 Synopsis: Jealousy, tragedy, survival, and revenge- the discovery of Christopher’s diary in the ruins of Foxworth Hall brings new secrets of the Dollanganger family to light and obsesses a new generation. With Flowers in the Attic and Petals on the Wind both now major Lifetime TV events, this first new addition to the Dollanganger story in nearly thirty years is a timely look at the events in the attic- from teenage Christopher’s point of view. Christopher Dollanganger was fourteen when he and his younger siblings-Cathy and the twins, Cory and Carrie-were locked away in the attic of Foxworth Hall, prisoners of their mother’s greedy inheritance scheme. For three long years he kept hope alive for the sake of the others. But the shocking truth about how their ordeal affected him was always kept hidden-until now. Review: I read Flowers in the Attic a very long time ago and even then I found it disturbing. To me, this was a retelling of the same disturbing story but it is drawn out into a series of new books. V.C. Andrews is no longer alive and her estate has various writers for these new novels. Honestly, I would say, just leave well enough alone. Week 2 was a successful week for me. 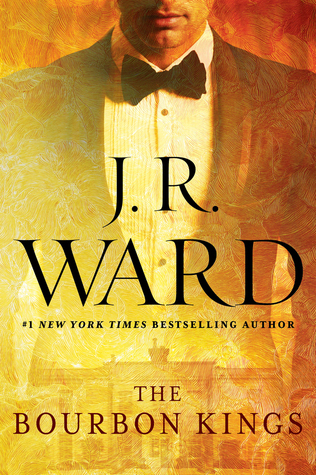 I read The Bourbon Kings by J.R. Ward. I have never read anything by this author before and was weary going into this book. It is not normally the type of book that I pick up to read but because of #ARCAugust, I did. I am so happy that I did too. This was a great book and I can’t wait to read the next in this series. The only negative thing I have to say is that because this was an ARC, I have to wait a while for the next book. 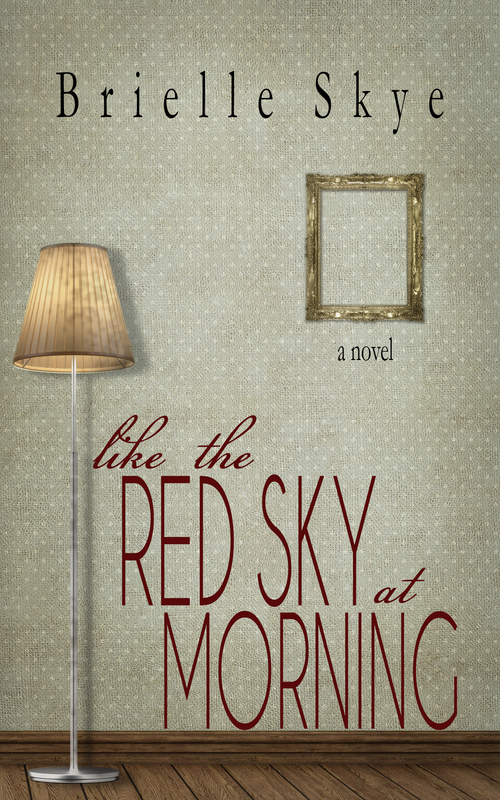 I gave this a 4 stars on Goodreads. Next up was Those Girls by Lauren Saft. This was a book I did not finish. Honestly, I barely started it. I was so annoyed in the first couple of pages that I refused to give this book any more of my time. This is a YA book, but I don’t mind reading those. The content and language and issues of this book in the first few pages were so much of a turn off to me. Taking the day after pill repeatedly as a high school student, using foul language for every other word; I work with college students and I hear it everyday, I do not need to nor want to read about it at home. 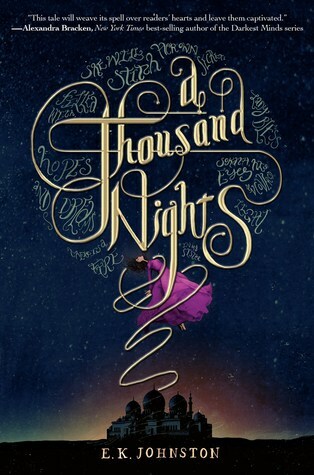 Lastly, I was able to read and finish A Thousands Nights by E.K. Johnston. This was a retelling of A Thousand and One Nights (Arabian Nights). It is a YA book and a fun read. The main character did not have a name which made it feel as if it could have been a story of anyone. I never really noticed that she didn’t have a name. The only issue I had was the over-usage of the phrases “my father’s father’s father” and “my mother’s mother’s mother”. 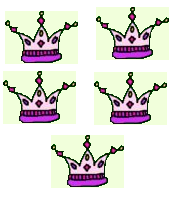 If that had been used once or twice, it would have been ok but it was repeated several times in a span of two pages. The cover art of this book is gorgeous. There is something about the colors that draw me in. They are subtle and vibrant at the same time. This is not the only retelling of this story to be release this year, however, it is the only one that I have read thus far. 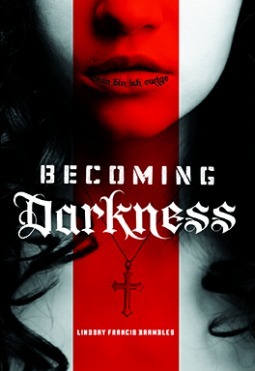 I gave this 3 stars on Goodreads. This is the first book I read for #ARCAugust. It is set to be released on September 1, 2015. Now since I am almost 35 years old, I don’t normally gravitate to reading YA contemporary books too often. However, there are times when a YA contemporary is just what I need. This book was everywhere at BookCon this year and I was not able to get my hands on it there. However, I was lucky enough to have won a bag full of books from BookCon through a Twitter contest held by @RileyMarie1196 in June and received some books that I hadn’t gotten. Let me start by saying that the cover of this book is stunning. The details and colors attracted me from the moment that I first saw it. 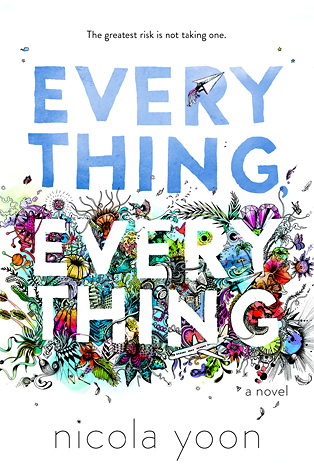 This is a debut novel about a young girl who is allergic to absolutely everything. She has never been outside of her house since she was diagnosed. She has never had a problem with that until a boy her age moves into the house next door and catches her attention. Without going into too much detail, this is really a story of risks and love; not just the risks and love between teenagers, but that of family, friends and the world around you. It was beautifully told and the drawings and graphics of some of the pages really added a special element to this story. It left me with the question of: How far would you go and what risks would you take to protect the ones you love? Hey everyone! I have decided to participate in #ARCAugust run by http://www.readsleeprepeat.org. During the month of August the goal is to get as many of your ARCs (Advanced Reader Copies) out of your TBR pile (To be Read). Confession: I have a few unread ARCs. Not as many as I thought; I definitely have reviews books that I should be reading too. I hope to read as many of them as I can in the month of August. 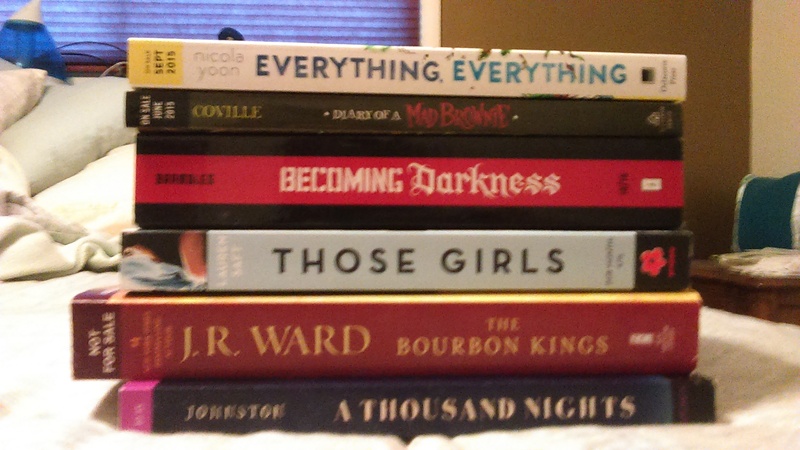 Here is a picture of my unread ARCs. Wish me luck!